Why having an ATS matters? An ATS is an applicant tracking system, ATS ’s technology solutions that automate a vast array of recruitment processes and simultaneously exists as a central archive for candidate data. ATS’s house and store candidate data - including pipeline history, CVs and various job applications. ATS’s are engineered to provide visible pipelines across the recruiting process - from sourcing to placement. With candidate data housed in a central database, teams with the right ATS transform their productivity, increase business growth and drive margins. A good ATS should automate the process of scheduling across the stakeholder communication process. Whether it's via SMS, email or even via ChatBot, your ATS should be able to sync calendars and set up interview dates. The benefits of a good ATS are simple - productivity, better processes, communication transparency and much more. 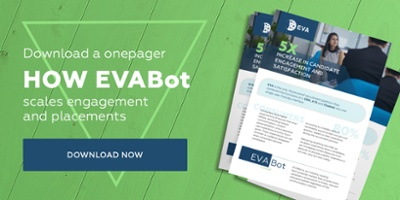 Read a one pager on how an intelligent bot can help you scale engagement and placements at the peak of your productivity.